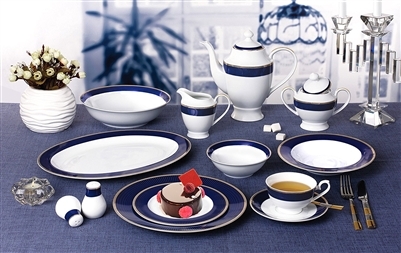 Serving Pieces Included, everything you need to set a beautiful table! This elegant bone china set has durable quality with a delicate and exquisite look. 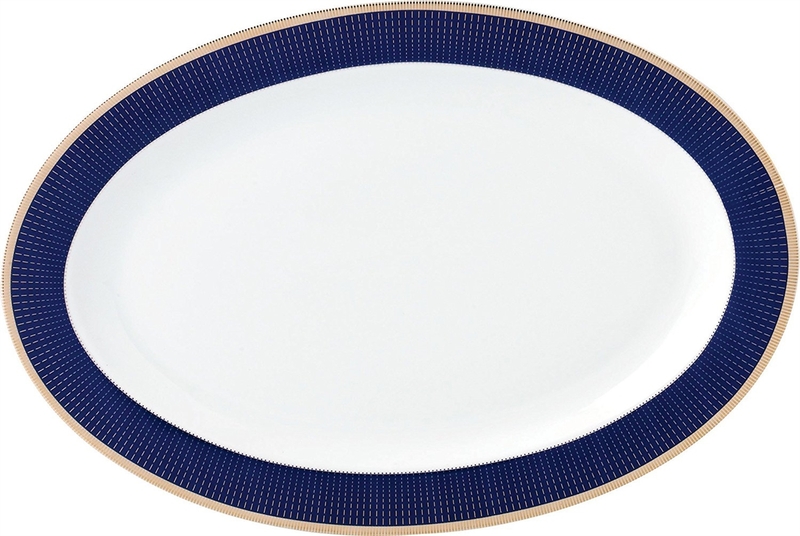 The Midnight pattern from the La Luna Collection by Lorren Home Trends is a bold and regal design featuring a navy blue thick band with specs of gold surrounded by a gold border on light weight translucent bone china. 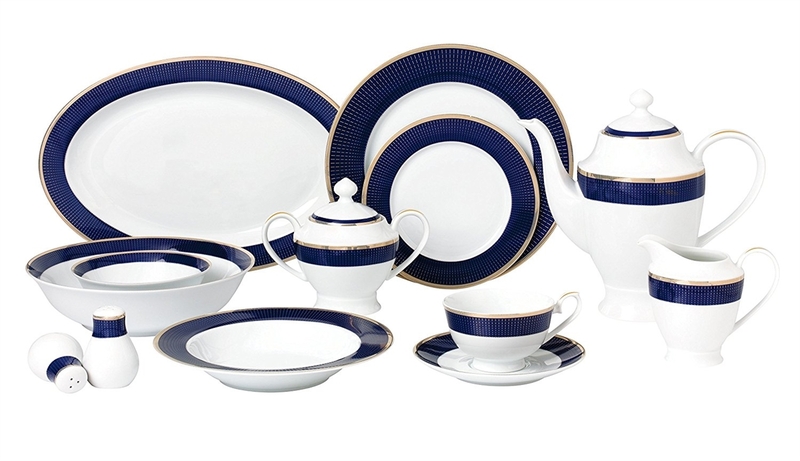 A complete service to easily entertain 8 people. 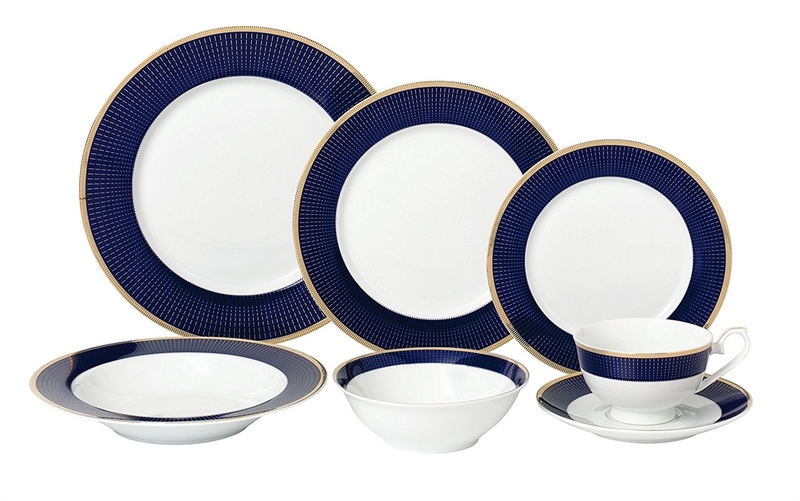 Set Includes: 8-10.5" Dinner Plates, 8-8.5" Soup Bowl(holds 8 ounces), 8-7.5" Salad/bread and butter dishes, 8-8 Ounce Cups, 8-Saucers, 8-5.5" Fruit or Dessert bowls, 1-14" Oval Platter, 1-9" Serving Bowl, 1-Salt and Pepper set 4", 1-Teapot with lid holds 48 ounces and measures 10.5" x 5" x 9", 1-Creamer 5" x 3" x4.5", and 1-Sugar Bowl with lid 7" x 4" x 5". Hand wash recommended.